Panaji: The Goa government has recenlty extended the retirement age for doctors working in state-run medical institutions from 60 to 62, a senior official informed. A government employees’ outfit has, however, opposed the move. “The order was issued recently by the under-secretary of the Labour Department. Doctors working in ESI hospitals, Goa Medical College and Hospital besides various other government institutions would benefit from the order,” state Labour Commissioner Jayant Tari informed PTI. Among those who will benefit reportedly is the brother of deputy chief minister Manohar Ajgaonkar. The Dy CM’s brother, Dr Shrikant, is employed in the ESI hospital in South Goa. “We have taken cognisance of media reports that the extension will benefit the minister’s brother. We have asked for details of the case. We are against the government extending retirement age in any of its services,” said Prashant Devidas, president of the Goa Government Employees Association (GGEA). While Dr Shrikant could not be contacted, Dy CM Ajgaonkar said everything about the extension of retirement age for doctors was done as per the law. Earlier in December last year, UP health minister, Sidharth Nath Singh had made a proposal to elevate the retirement age of doctors from 62 years to 70 years in UP sun medical institutions. “If politicians can work till the age of 75 then doctors who are healthy can also give their services till 70 years. I will propose to the cabinet that their retirement age be raised to 70 years. There will also be a provision for voluntary retirement after 62 years of age,” Singh had stated. This extension was done in order to tackle the rising shortage of doctors in the government health sector. 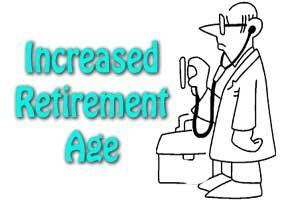 It is the will and wish of Govt to extend the retirement age even upto 95years.Can a doctor fo justice to patients? In Karnataka even young Govt doctors do not attend patients after 10.30am. They go and practice in clinics or Nursing Homes. Not all, but majority do like this. If caught, thy escape by paying \”\”special fees\”\”. When young doctors are after the money and don\’t stay in Hospitals, then, how can aged doctors after 60 years show interest and attend regularly? What about young doctors who are employed? Doctors should undergo fitness test physically and mentally after 60,years if at all They are to be recruited. GIVE EMPLOYMENT TO YOUNGSTERS. HAVING THE BLESSINGS OF CORRUPT CUNNING CROOKED CARELESS CASTIEST COMMUNAL POLITICIANS & BABUS THE BUEROCRATES ONE CAN MADE DEAN DIRECTOR OF A MEDICAL COLLEGE EVEN WITH VALID DEGREE, EXPERIENCE , SENIORITY , MERIT ……… WHAT A STATE , WHAT A COUNTRY . I WISH THE CASTEIT COMMUNAL CARELESS CROOKED CUNNING PEOPLE DIE WITH CANCER , HIV AIDS ……. THEIR FAMILIES VANISH FROM THE PAGES OF THE HISTORY.